The National Institutes of Health is awarding separate research awards to four young University scientists totaling $8 million to conduct promising but unconventional research that could lead to new medical treatments and a better understanding of the factors that contribute to problem adolescent behavior. The NIH grants are part of a $100 million investment in the future of science to 39 innovative researchers nationwide. 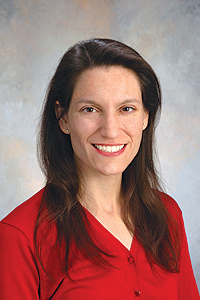 Margaret Gardel, 30, Assistant Professor in Physics and the College, and Rustem Ismagilov, 34, Associate Professor in Chemistry, will each receive $2.5 million in direct funding (not including overhead costs) to conduct biological research over the next five years as NIH Director’s Pioneer Award recipients. Gardel and Ismagilov are among 12 recipients of the 2007 Director’s Pioneer Awards, which are designed to support individual scientists of exceptional creativity who propose pioneering approaches to major challenges in biomedical or behavioral research. Receiving NIH New Innovator Awards, meanwhile, will be Kristen Jacobson, 39, Assistant Professor in Psychiatry, and Dorothy Sipkins, 38, Assistant Professor in Medicine. Jacobson and Sipkins are among the first group of NIH Director’s New Innovator Award recipients. The 27 New Innovator Awards will each provide $1.5 million in direct funding to stimulate highly innovative research by promising new investigators. In her project, Gardel will investigate how living, biological matter differs from inert, physical matter. Her work could ultimately provide biomedical scientists with the means to devise new therapies for the treatment of cancer and other diseases. Gardel specializes in soft condensed matter physicsÑthe rules governing the deformation of soft materials such as biological tissue, shaving cream and gelatin. She received her Ph.D. in physics from Harvard University in 2004 and then completed a postdoctoral fellowship in physics at the Massachusetts Institute of Technology. A second postdoctoral fellowship in cell biology followed at the Scripps Research Institute in California. Gardel joined the Chicago faculty this summer. She maintains office and laboratory space in the Gordon Center for Integrative Science, which houses physicists, chemists, biologists and medical researchers in close proximity. She will draw upon this varied background and the expertise of her Chicago colleagues to develop new ways to study the cytoskeleton, the dynamic scaffolding of the cell. “The cellular cytoskeleton is, inarguably, the most bizarre, complex and exciting material that we have ever confronted,” Gardel said. The major components of inanimate matter, such as a car, typically remain essentially unchanged from day to day. Not so with a cell, which maintains shape via rods of filamentous proteins called “actin.” “The cell basically assembles and disassembles its clutch, its engine, its wheels, its whole structure. We want to understand how those materials in the cell are assembling and disassembling,” Gardel explained. Motor proteins must interact with one another and the cytoskeleton in order to generate the forces needed for a cell to change its shape. “Shape changes occur during cell division, when a mother cell divides into two daughter cells and in cell migration, which is required for embryo development. And it’s misregulated in human disease, such as cancer,” she said. 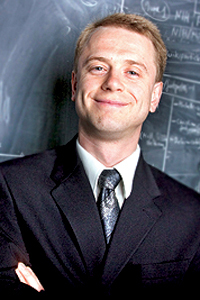 Ismagilov joined the Chicago faculty in 2001. He specializes in microfluidic technologyÑthe flow of fluids through channels thinner than a human hairÑto understand and control complex chemical and biological systems at critical times and locations. With his Pioneer Award, Ismagilov will develop droplet-based microfluidic technologies for quantitative studies of protein aggregation diseases and aging at the molecular level and in entire organisms. Current studies of protein aggregation and disease come with a high price tag in labor and time. Tiny test samples and the inability to experimentally reproduce aggregation events create further problems, but microfluidics addresses all of these issues. For studies at the molecular level, Ismagilov will develop microfluidic systems capable of rapidly generating, manipulating and assaying protein aggregates of various sizes, shapes and compositions. In parallel studies at a broader level, he will develop microfluidic technology to precisely induce and monitor protein aggregation in living cells and organisms over time. These techniques will allow him to observe the initiation and progression of protein aggregation diseases. In addition to his Pioneer Award, Ismagilov also has been named the recipient of the 2008 Award in Pure Chemistry from the American Chemical Society. The award goes to scientists no older than 35 in North America who have accomplished research of unusual merit for an individual on the threshold of his or her career. Ismagilov will receive the award next April at the ACS national meeting in New Orleans. Jacobson will study the interactive effects of biology and genetics as well as family, peer and neighborhood characteristics on adolescent problem behavior, particularly how those factors relate to variations in problem behavior among this age group. A Chicago faculty member since 2005, Jacobson has a broad, multidisciplinary background in adolescent development, behavioral genetics and the complex role of genes and environments on individual differences in problem behavior. 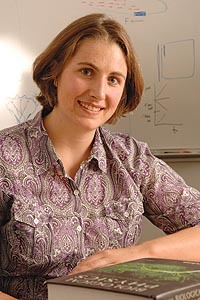 In 2003, Jacobson received a National Institutes of Mental Health Mentored Scientist Career Development Award designed to identify biological markers for problem behavior that may run in families. Phase 1 of Jacobson’s study consists of an in-school assessment of approximately 7,000 6th to 8th graders in 10 socio-economically, racially and ethnically diverse public schools in Chicago. The assessment will obtain data on environmental and psychosocial factors that may account for socio-economic, racial and ethnic differences in problem behavior. Next, 800 of those 7,000 students will be studiedÑ400 pairs of siblings, half siblings and unrelated siblings. They and their caregivers will be brought to the University for neuroscience and behavioral assessments to identify the variables that account for individual differences in problem behavior, and to further determine whether these effects are genetically or environmentally caused. The third phase will take 200 of those 800 students and study 60 sibling pairs where the problem behavior is similar, and 40 pairs where the problem behavior is dissimilar. Each student will be given a brain scan using functional magnetic resonance imaging to look at neurological patterns underlying behavioral differences in families. Finally, a small pilot study of 20 sibling pairs with extremely dissimilar problem behavior will investigate whether environments alter gene expression. “This nested design uses a bio-ecological framework to measure risk and protective factors at multiple levels of analysisÑfrom neighborhoods to neurons and beyond, ” Jacobson said. In her project, Sipkins will investigate molecular characteristics of tissue micro-environments, or “niches,” within the bone marrow and how normal, healthy hematopoietic stem cells, which give rise to the many kinds of blood cells, compete with malignant cells to occupy these coveted niches. A medical oncologist who specializes in leukemia, Sipkins came to the University in 2005 following a fellowship at the Dana-Farber Cancer Institute in Boston. In 2006, she was one of the first 10 grant recipients selected by the newly created Illinois Regenerative Medicine Institute, one of only four state programs at the time that could commit public funds to stem cell research. The Innovator Award will enable Sipkins to continue to combine state-of-the-art imaging techniques, performed on living mice, with cell and molecular biology approaches to learn more about these stem cell niches. She will study how normal, healthy bone marrow stem cells find a niche and how niche environment regulates stem cell functions such as self-renewal and differentiation. Sipkins also will focus on the role of the niche in leukemia. Malignant cells often invade these niches, crowding out the normal tenants. Her team already has identified the molecular signals that attract leukemic cells to a niche, allow them to gain entry and eventually take over. 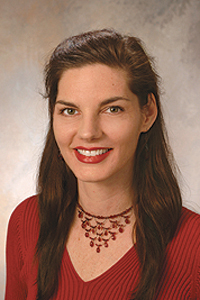 Her goal is to define the molecular architecture and functional significance of a niche, determine how tumor growth impacts the niche, learn how benign and malignant cells compete within a niche, and use this knowledge to design precisely targeted anti-cancer treatments that spare normal bone marrow and improve the efficacy of stem cell-based therapies. “Given the importance of stem cell based transplantation therapies as well as the clinical significance of tumor metastasis to the bone marrow, there is great therapeutic potential in understanding these cellular interactions,” Sipkins said.